A human face stares from these remnants of Lapita pottery, dated 1000 BC. They come from the Santa Cruz group of islands, south-east of the Solomon Islands. Around 3000 BC ceramic-making peoples appeared in Taiwan. Taiwanese pottery was red-slipped but otherwise plain. Over the next 1,500 years their descendants moved south and south-east towards Near Oceania. In the Bismarck Archipelago these Austronesian peoples mixed with the indigenous inhabitants and the Lapita culture, with its distinctive pottery, emerged. 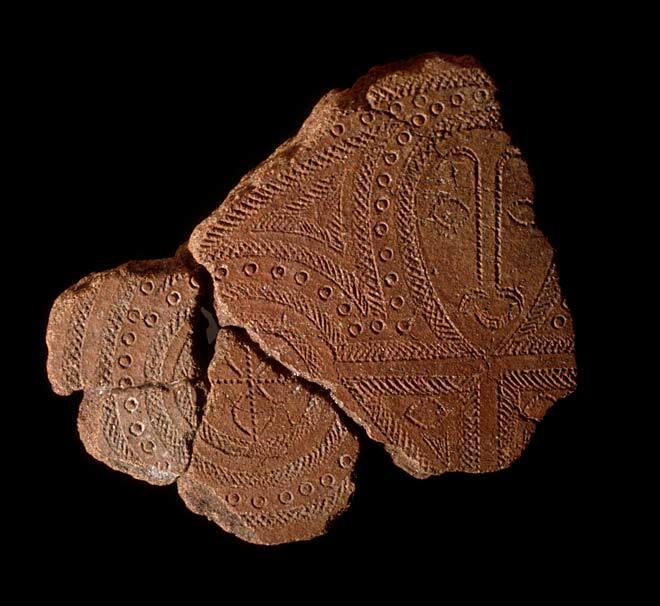 Lapita pottery had surface decorations; these motifs probably already existed in tattoos. Permission should be sought from the University of Auckland, Department of Anthropology, Anthropology Photographic Archive: https://www.auckland.ac.nz/en/about-us/connect-with-us/contact-us.html.